According to the CDC, about 30 percent of adults nationwide report experiencing joint pain. 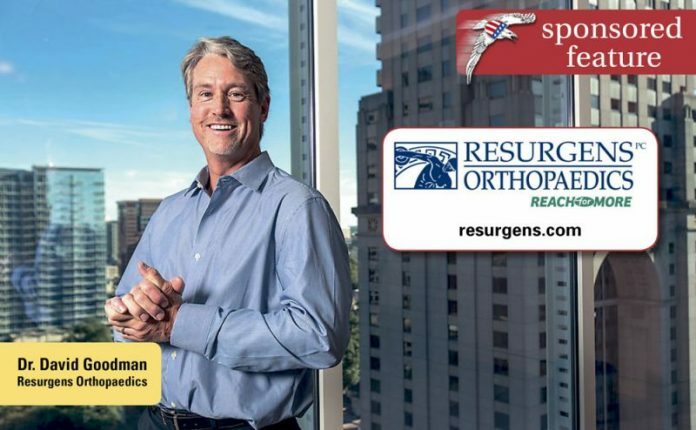 Statistically, the knee and the hip are two of the most common areas of such pain, a fact that doesn’t surprise the joint specialists at Resurgens Orthopaedics. According to Dr. David Goodman, who specializes in sports medicine and total joint replacement, hip and knee issues represent about half of his practice. After completing his sports medicine fellowship at the esteemed Andrews Sports Medicine and Orthopaedic Center under Dr. James Andrews, Dr. Andrachuk’s focus is on hip arthroscopy and arthroscopic and reconstructive surgery of the knee and shoulder. By inserting a small camera into the joint to guide him, he can perform minimally invasive reconstructive surgery through a very small incision, which reduces blood loss, speeds recovery, and results in great outcomes for most patients. Of course, for some patients, neither non-surgical intervention nor reconstruction is the best option. “When we can’t get past the pain through other methods, we begin looking at joint replacement,” says Dr. Goodman. While many patients come to see Dr. Andrachuk and Dr. Goodman for knee and hip issues, both doctors – as well as all the specialists at Resurgens Orthopaedics – provide care for all joints.